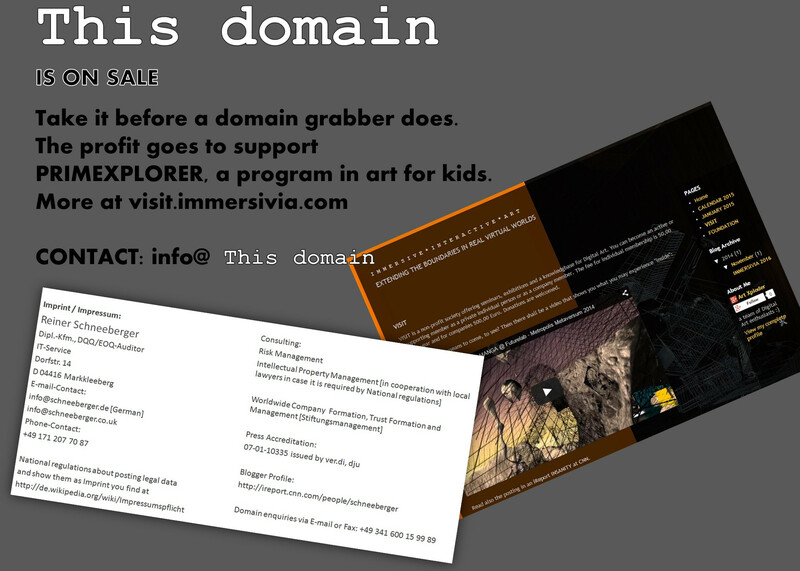 For a strong supporter of the arts you may sponsor this domain. BREAKING NEWS: THE ROOM FERRISQUITO is done. The Grand Opening in Second Life happend already. And there is a booklet to take at sim Claressa. Please read the reports by Inara Pey and Mona Eberhardt to get a full picture. Thank you Inara for the pre-anouncement and Mona for the report. On Wednesday, September, 17, 2014 there will be the Grand Opening of ROOM FERRISQUITO in opensim grid Metropolis at 1.00 PM PDT. IM Thirza Ember in SL or in opengrids or check in facebook for group HG Safari. Good luck and let´s have a great time! The forgotten world of Ferrisquito. Creating a room for an eternal picture of 25 early works of Bryn Oh. All works listed are made between 2008 and 2010. Bryn Oh presented her first 3D art works in 2008 [Avatar creation date: 3/25/2007] – so I see the ‘Ferrisquito collection’ as the one of Bryn Oh´s early works. This project is even suited for a new inhabitant in SL interested in art, presentation & art communication and research. But there are more layers in case one wants to “move deeper”: To reflext the past, the present, and the future of digital art in 3D environments. Send me an IM in case you want to get more information. You rez the piece of art. You make some photos. This you do for all 25 pieces. Then you arrange the photos. You work on a presentations sequence. you frame and name them. You make a notecard for each (later to be used in our advanced information giver). You work on a room layout. You work on a “visitor flow” (the path – incase you have more than 1 room in your concept). The “consumerist sherpa” is available to be rezzed in 3D as a permanent object to trigger and generate a – or “the – message”. This piece has to become a “main focus”. Some other pieces I have in mind could be placed in to give the presentation some “color”, but it is too early now to tell more about this – as I offer you to work out a concept. I run an opensim installation which looks from the point of the user quite similar to Second Life. The main difference is that this system will become frozen and the content will be conserved in a way that is it possible to visit it by future generations. So in simple words: its a time capsule for art and the technology we use now. And you create for this “the room Ferrisquito”. I want to underline: everyone interested in doing so is able to perform it. Simple basic skills in PC, graphic programms, building, that´s it. Of course you have to work hard as I will not accept anyhing less than excellent. But no scripting knowledge is needed! Scripting is done by others. And you get a daily feedback when you have moved on in realisation. I am highly motivated on this project so I offer personal support. I was a lecturer for computer art at the University of Munich and also in mainframe development for a US computer manufacturer. Now I am head of an art trust. I say this so you can be sure the project will work and not stay as a draft or get stuck in the middle. The core targets that have been set up at the beginning of the project, I call often VULCANICUS, are already reached. But some “add-ons” are still possible as I got more works of art as expected for the time capsule. This made me think of a bigger approach. You will be part of this bigger approach. Neverthless there is no pressure coming up. The complexity is not on you to solve. You just work out a “black box” fitting for Ferrisquito. Only the end date is fixed as my project manager will complete his university degree in August 2014. So in September is the public showing of it. You shall have skype or inworld voice available when needed as typing can become quite time consuming OR you are experienced and you show me some projects you have done. Then you can stay full in a virtual (unnamed) status. But keep in mind when you want to be mentioned in books, catalogues, reports and in RL presentaitons of “the server and the content” it might be difficult in time to add that you with RL name xyz has made the room. You might have lost in 20 years your SL avatar name … but lets skip such thinking for now. There is no need to add RL data in any form. It stays just as an offer to be mentioned RL wise. You may decide when the book is printed in August. Lets assume you made it and the final “room” for Ferrisquito is done. It will be presented in SL by a grandopening and showed for a month or two and also on demand and become permanent in the opensim environment, running 24/7 for visitors access in 2014 up to 2017 (being part of the Virtual Biennial). Then it goes into the mentioned frozen state and will be reloaded in 5 year, 10 years, 20 years and for ad-hoc events. As my own works, and the works of my old professor, are collected and funded by major museums and by The Programmed Art Trust (Stiftung Kunstinformaik) the server willl be kept in a ready to use status for many years (some services are prepaid by now until year 2112, some cant be paid now for the period of 100 years that I have in mind). Feel free to contact me in a way that pleases you. Good luck and as i said: you dont need to be very experienced to make “this box” happen.